is the industry’s only family of field-swappable sensor-heads. 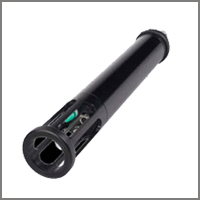 Available for Conductivity, Sound Velocity, Temperature, and Pressure, each sensor-head contains its own embedded calibration, and can be moved from instrument-to-instrument without impacting field accuracy. Changing sensors is easy: simply unscrew one sensor-head and replace it with another. here to go to www.AMLoceanographic.com. Plus units have been built, making the CTD Plus a reliable field partner. Applied Microsystems’ Micro SV provides single-sensor, direct measurement of sound velocity. By directly measuring the time-of-flight of an acoustic ping, the Micro SV improves sound velocity accuracies by a factor of five over CTD based calculations such as Chen & Millero or Del Grosso. The Micro•X is a real-time, single parameter instrument that allows you to field-swap the instrument’s sensor-load. 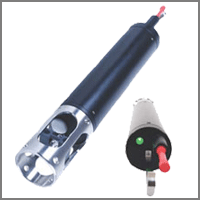 Unlike other X•Series instruments, the Micro•X is sensor specific, meaning that sensor type cannot be changed. However, within a given sensor type, range can be swapped, a feature that is particularly useful in depth measurement applications. The Minos CTD is a logger that was specifically designed for vertical profiles from small launches or boats. ½ the size of a CTD Plus v2, this instrument is much easier to handle in small spaces. The instrument also has an LED light which provides a visual status indicator to the end-user. With 25Hz sampling and rapid sensor response times, the Minos CTD provides high resolution data even in high-speed applications. Matched sensor response times eliminate the need for post processing of data. A logger, the Minos SVP was specifically designed for vertical profiles from small launches or boats. ½ the size of a SV Plus v2, the instrument is much easier to handle in small spaces. The instrument also has an an LED light which provides a visual status indicator to the end-user. The Minos•X is a small vertical profiler that allows you to change the instrument’s sensor load, in-the-field and on-demand. With the Minos•X, your SVPT can become a CTD; Shallow pressure sensors can be swapped for deep; and temperature range can be extended or tightened, as needed. One single profiler meets multiple deployment requirements. The Plus•X is a logger that allows you to change the instrument’s sensor load, in-the-field and on-demand. With the Plus•X, your CTD can become an SVTP; shallow pressure sensors can be swapped for deep; and temperature range can be extended or tightened, as needed. One single logger meets multiple deployment requirements. Xchange is the industry’s only family of field-swappable sensor-heads. 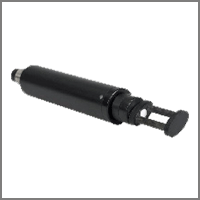 Available for Conductivity, Sound Velocity, Temperature, and Pressure, each sensor-head contains its own embedded calibration, and can be moved from instrument-to-instrument without impacting field accuracy. Changing sensors is easy: simply unscrew one sensor-head and replace it with another.